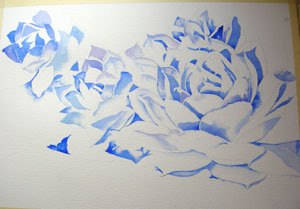 This is a large painting, on a full sheet of watercolor paper, so the photos are a little difficult to get even in light. 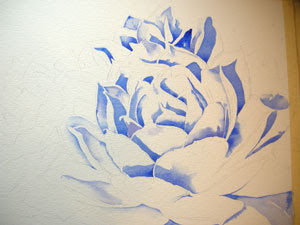 That said, you can see that I have continued to add and define the shadow areas with French Ultramarine Blue. The values are so important in this piece (as with any painting) that I am working to build them right from the start. I will be glazing other colors onto the fully dried pigment later, so I want to keep them transparent, not heavy or thick, but rich with color where a darker value is called for. I have started to work here with Violet and Prussian Blue to intensify the values, provide a little variety in color and to continue to build interesting shadow areas. I work through the entire painting with this technique before I move on to the next stage. This painting is beginning to work already simply because the values and edges are correct. I hope I like it as much when it is done as I do now!!! Just a note - So far this piece has taken over 6 hours including the preparation of the drawings and getting the glaze established to this point. Be patient with your work. Anything worth something always requires time and patience.